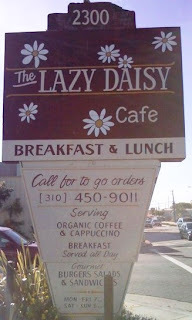 This was the day that I was getting the smog check done on the car, and Lazy Daisy Cafe sign boasted of gourmet burgers. 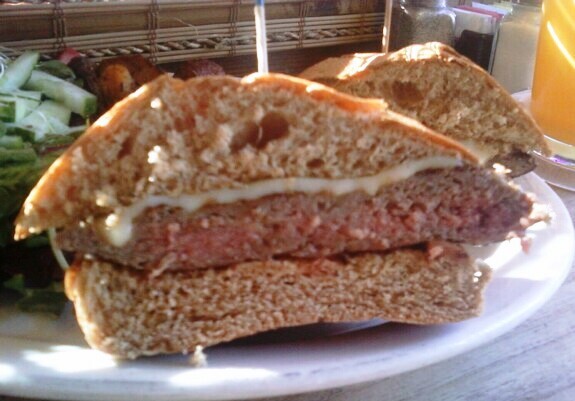 The menu advertised Ground Sirloin burgers, so I ordered one. I ordered one of the Ground Sirloin Burgers at $8.95, and I ordered it with a slice of Jack cheese for an additional $1.50. Yeah----a buck fifty for a slice of cheese--you read that right. It was convenient, and I was hungry, and well....it said it was "gourmet." 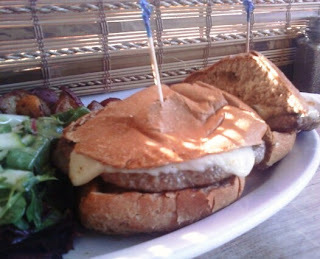 The Beef: If "Ground Sirloin" and "Gourmet Burgers" were supposed to mean "flavorless and rubbery," then Lazy Daisy Cafe nailed the beef. Bland and rubbery was what I got. No aging, no beefiness, no juiciness, and no iron flavors were present. They assured me that the beef had not been frozen, so it must have been manipulated to death to achieve that level of chewiness and bloodlessness. The Sear: The sear looked pretty good, but it was as flavorless and rubbery as the beef from which it was derived. 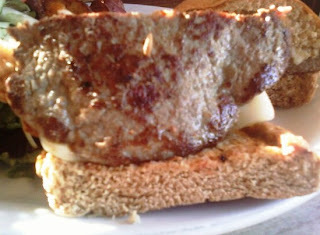 The Seasoning: The burger was weakly seasoned with something oniony. I had to wash my hands twice to rid myself of the smell. There was certainly not enough salt or pepper to save the beef from itself. The Preparation: They cooked the thin, 5 oz. patties of finely ground sirloin to Medium on a reasonably hot griddle. The Cheese: The $1.50 slice of Jack Cheddar was meek and on the rubbery side. It certainly failed to compensate for the blandness of the beef or the chewy texture. The Bun: I chose the Whole Wheat option--my other choice was Grilled Onion Bun...gross. The whole wheat bun was barely toasted and very bland. It was moist, however. The Meat to Bun Ratio: Meh--I didn't really care. Three bites in, and I sent this back. It was not worth the effort of chewing it. The Fries: Instead of fries Lazy Daisy Cafe provides baby red potatoes and a green salad. Both of these were also awful. The potatoes were gummy--they had been cooked for far too long, and should not have been served. The salad was warm and limp--it had obviously been dressed and left to sit out for at least 30 minutes prior to reaching my plate. 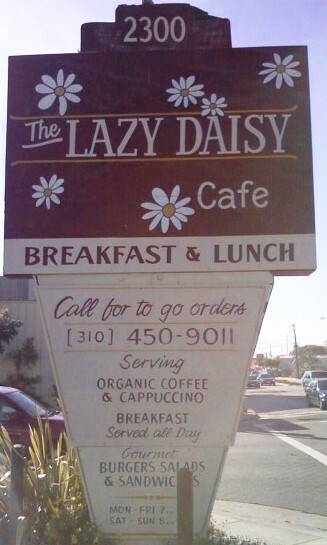 The Value: Lazy Daisy Cafe comped the meal. Had the ingredients been fresh and properly prepared, this smallish burger would have been a less than stellar value. Burger Review : Never again for a burger--I hear they have a good breakfast, though.